Miss the previous chapter? You can always find it here. Coded takes place immediately following the finale of Kingdom Hearts II, when Sora, Riku and Kairi receive the King’s note. While organizing the records in his journal, Jiminy Cricket’s curiosity about the line “Thank Namine” ends with him finding a message he didn’t write: “We must return to free them from their torment.” To investigate the message, Mickey digitizes the journal and enters the simulated world to investigate. He creates a Data-Sora to carry out the contents of the journal to find out who the mysterious note refers to. 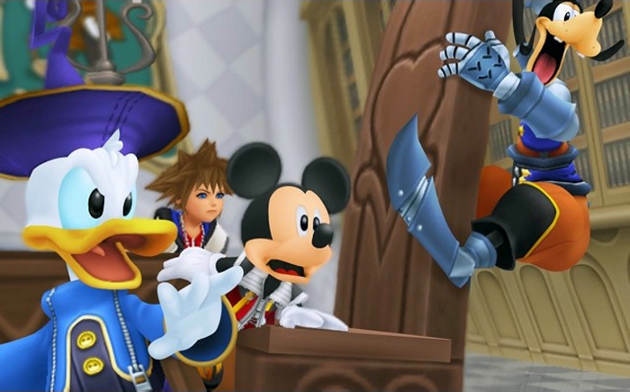 As Data-Sora travels through the digitized world, Heartless appear in Disney Castle. Everyone is saved by Data-Sora, and a cloaked figure appears, informing the group that he is Jiminy’s Journal taking on the form of Riku. He explains they are now in the data world. Maleficent and Pete appear and there’s an encounter, ending with them abducting the journal. Mickey gives chase, while Data-Sora makes his way through Hollow Bastion. Later they are confronted by the Journal being controlled by Pete, whom they defeat. Jiminy’s Journal falls unconscious. Mickey arrives full of knowledge as always, and tells them they need to destroy all the bugs in the data to awaken the journal. They then enter Riku’s data world, and find Maleficent and Pete once again. After defeating the two for what has to be at least the fourth time, Mickey discovers that he will have to return to the real world soon, but the journal will have to be erased once it’s completed. This means Data-Sora’s memories will go away, but Sora requests more time so he can save Pete and Maleficent. Though he finds them, they are seemingly erased by Sora’s Heartless before he can help them. After defeating his Heartless, Sora learns the Journal saved Pete and Maleficent. They leave shortly before Mickey does, which destroys the Journal. A new message appears that says a new door has opened. Mickey returns to the data world and takes Data-Sora to Castle Oblivion, where he fights a man in a black cloak. Upon his defeat, this man is revealed to be Data-Roxas. He gives Data-Sora a card as Mickey appears. He then opens the new door to find Namine behind it. She reveals Sora’s nature as the “Key that connects everything” through his ties with herself, Roxas, and Xion. She then goes on to tell him about three figures (remember Terra, Ven, and Aqua?) 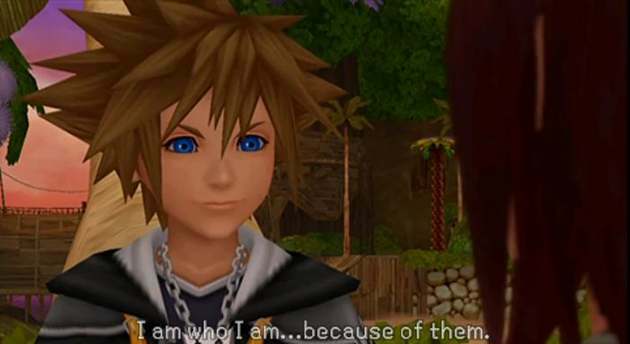 who are also tied to Sora’s heart that need his help. 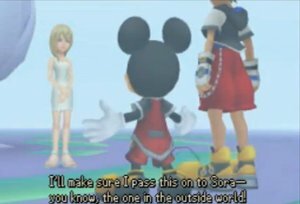 Mickey promises to notify the real Sora of this and heads back to the real world. The game ends with Mickey sending his note to Sora, telling him of these events. That’s what the message at the end if KHII was about! See how everything is tied together? Roxas, Xion, Namine, Terra, Ventus, and Aqua are all tied to Sora’s heart. Before we move on to next week’s article, we must not forget Birth By Sleep’s epilogue. This is actually a secret ending that has to be unlocked, but it holds importance nonetheless. It plays out as a cinematic, starting by showing Terra and Xehanort’s hearts lying dormant in Terra’s body, waiting to see who will gain control. Though Xehanort is stronger, Terra reveals he has Master Eraqus’ heart sealed within his own. Now skip to after the end of Kingdom Hearts II, Aqua is still wandering the Realm of Darkness. She encounters Ansem the Wise who had survived the explosion of his Encoder with few of his memories remaining. 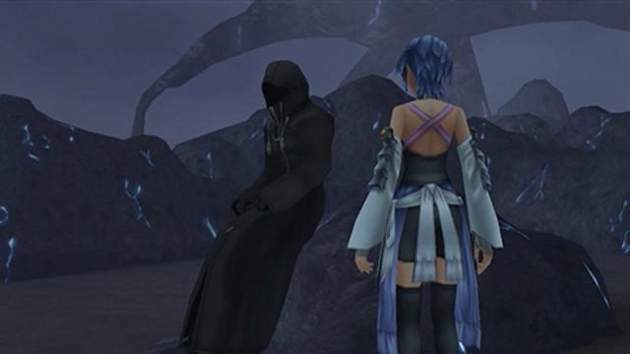 He reveals to Aqua that while darkness threatens to swallow the worlds again, hope lies in Sora, who is preparing to set out on another journey to help those whose hearts are connected to his own. So all this time after the events of Birth By Sleep, Ventus has been asleep, Terra’s heart has been trapped inside his body with Xehanort, and Aqua has been trapped in the Realm of Darkness. They’ve been waiting for ten years! Make sure you don’t miss the final episode of Re:Cap, coming next week!